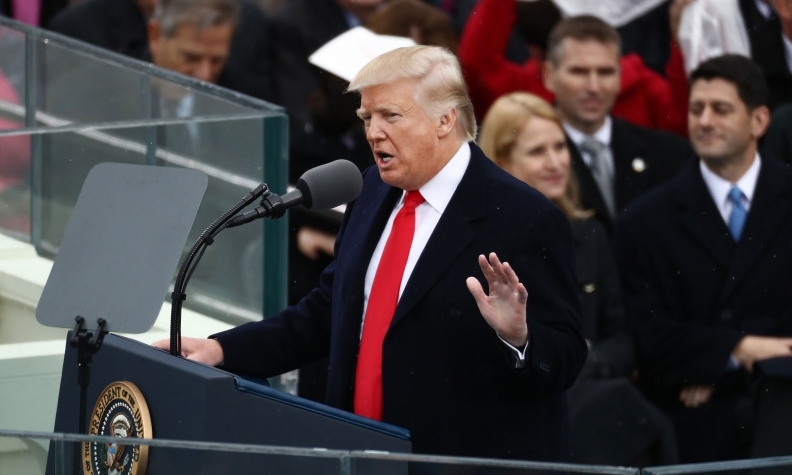 "We will follow two simple rules," President Trump said in his inaugural address, "buy American and hire American." President Donald Trump on Sunday said he will soon meet with Prime Minister Justin Trudeau to discuss terms of the North American Free Trade Agreement. “We’re going to start some negotiations surrounding NAFTA," Trump said during a White House senior staff swearing-in ceremony. "Anyone ever heard of NAFTA? I ran a campaign based on NAFTA." Trump has threatened to pull the United States out of NAFTA if he doesn't get what he considers "a fair deal for American workers" during renegotiations. Trudeau spoke with Trump by phone Jan. 21, the day after Trump took office, and briefly discussed "various areas of mutual interest," the Prime Minister's Office (PMO) said in a statement. It was not clear what those areas are or whether they include NAFTA, but the PMO statement noted "the depth of the Canada-U.S. economic relationship." Trump also said he’d be meeting with Mexican President Enrique Pena Nieto, who is scheduled to visit Washington on Jan. 31, U.S. Press Secretary Sean Spicer told reporters Jan. 21. Minutes after his inauguration, Trump announced his intention to withdraw from the Trans-Pacific Partnership and renegotiate NAFTA, moves that analysts say could have profound effects on the automotive industry. The announcement, posted online by Trump’s new White House team, comes after years of his blasting both trade deals as job-killers that hurt American workers and move jobs overseas. In confirmation hearings Jan. 18, Trump’s choice to head the Commerce Department, former auto supplier executive Wilbur Ross, signaled that renegotiating NAFTA would be an urgent priority. NAFTA, which took effect in 1994, created a free-trade bloc linking the U.S., Canada and Mexico. The White House team said Jan. 20 that if the NAFTA partners refuse “a renegotiation that gives American workers a fair deal,” then the president will give notice of the country’s intent to withdraw. After initially congratulating Trump in a statement, Trudeau pledged to work on fair trade with the United States. "Together, we benefit from robust trade and investment ties, and integrated economies, that support millions of Canadian and American jobs.," Trudeau said. "We both want to build economies where the middle class, and those working hard to join it, have a fair shot at success. Tony Faria, co-director of automotive and vehicle research at the University of Windsor's Odette School of Business, said he isn’t surprised by the president’s intentions but said it’s too early to tell what the changes will mean to Canada. Canada has agreed to the TPP but as Faria noted “it’s not necessarily been vigorously supported” by the public, particularly not by autoworkers. He said Canada could also use the opportunity and also pull out of the TPP or see America’s withdrawal as an advantage. When it comes to NAFTA, Faria stopped short saying a U.S. withdrawal or proposed “border tax” on vehicles built outside the United States could cause a trade war. “Any tariff he wants to put on any vehicle coming from Canada to the U.S., the natural thing for Canada to do is put the same tariff on any vehicle coming to Canada from the U.S.,” Faria said. “If the U.S. pulled out of NAFTA, we’re talking about tariffs being imposed and we ship 85 percent of the vehicles built in Canada to the United States. The same thing happens the other way. For example, Canada’s top-selling vehicle in 2016 was the F-series pickup, built in Michigan and Kansas. Ford sold 145,409 of the trucks in Canada in 2016. A U.S. withdrawal from NAFTA would cost at least 31,000 U.S. auto jobs and cause vehicle prices to rise, a recent study by the nonprofit Center for Automotive Research found. “There are numerous studies that suggest NAFTA has been good deal for the United States, too, even though it’s been a better deal for Mexico,” Faria said. Despite the fast turnaround on trade from the White House, the website of the U.S. Trade Representative’s office still prominently featured the TPP and its benefits to American workers, reflecting the Obama administration’s position. Although there was no specific mention of it in the Jan. 20 release, Trump has repeatedly vowed to slap a 35-per-cent tariff on all Mexico-built vehicles sold in the United States. The CAR study said that would result in a loss of at least 6,700 North American assembly jobs and 450,000 units of U.S. auto sales. Because Mexican-made vehicles are made of about 40 per cent American parts on average, and American-made vehicles are made of about 12 percent Mexican parts, about 20,000 U.S. parts manufacturing jobs and 11,000 U.S. assembly jobs could be lost as a result, CAR said. Mexican officials have vigorously defended NAFTA as crucial to U.S. economic competitiveness. President Pena Nieto, on his official Twitter account, congratulated President Trump after his inauguration and vowed to strengthen relations between the two governments. "We will establish a respectful dialogue with the government of President @realDonaldTrump for the benefit of Mexico," he wrote just after Trump's swearing in. "Sovereignty, the national interest and protection of Mexicans will guide the relationship with the new government of the United States," Pena said. Auto industry leaders have said in the run-up to Inauguration Day that they hope government negotiators will convince Trump of the value of NAFTA for all three nations, and particularly of Mexico's role in making automakers more competitive. But union leaders in both the United States and Canada have attacked NAFTA since the beginning. U.S. automakers have repeatedly stressed their support of free-trade deals, although some, such as Ford Motor Co., have warned that such deals must have protections to guard against currency manipulation. The new administration on Jan. 20 also vowed to crack down on nations that violate trade agreements and harm American workers. “To carry out his strategy, the President is appointing the toughest and smartest to his trade team, ensuring that Americans have the best negotiators possible,” the White House’s release said. “For too long, trade deals have been negotiated by, and for, members of the Washington establishment. President Trump will ensure that on his watch, trade policies will be implemented by and for the people, and will put America first. Michael Martinez, John Irwin and Greg Layson contributed to this report.